Govtjobstyari.com is a website which helps people prepare for job exams in India. The Mission of providing Free and Quality study material was started in February 2017 and still going on. The Motive Behind creating Govt Jobs Tyari is to come forward to get help and to help others. We strongly Believe in Slogan Given By Prime Minister of India ” Shari Narendra Modi” – Sabka Saath Sabka Vikas . By taking this in consideration We have begun our journey. We are in the field of education providing guidance to the students, aspiring for the government and public sector jobs. We create study material by keeping in to mind that Everyone should be able to take benefit of our initiative. Govt jobs Tyari has made preparation quite easier for the students of remote location or rural areas. 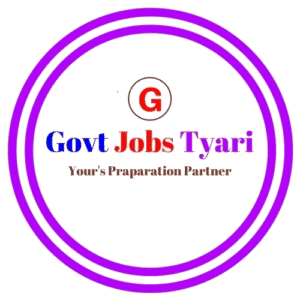 Govtjobstyari is currently positioned as a one stop Preparation solution for Banking, SSC, GATE, TET (teaching), JEE, NEET and other important exams in India. People can contact us through any mode of communication, we are available almost on all SOCIAL platforms. As a team GOVT JOBS TYARI, we strongly believe that Good Content + Collaboration With online communities can make learning very easy and significant for all. We believe in helping our society and expect same to our society. Students can read from here, can get help in their inbox, can comment their query in comment box, can understand and learn through videos.